Zambia is a country endowed with substantial mineral sources which are located throughout the country and since the establishment of the country as a sovereign nation, copper has been and still is, the largest contributor to the Zambian economy. The country also has a history of gold mining, yet on a much smaller scale when compared to that of copper. With twenty large deposits having produced a total of 2 tons of gold, the Zambian gold mines are still relatively untapped and awaiting exploration. Luiri Gold Limited is an exploration and evaluation stage company that was founded in 2004 and is based in West Perth Australia. The company engages in the acquisition, exploration, and development of mineral properties and as of now, it primarily explores for gold and copper-gold deposits. The company holds two mining licenses in southern-central Zambia focused on the Dunrobin and Matala gold mines collectively called as the Luiri Hill gold project. According to CEO Clinton White, the Company’s objective is to create an asset base that will deliver exceptional returns to shareholders and profit all stakeholders. Luiri Gold focuses on developing shareholder value and growth through the acquisition and responsible development of mineral resources and mining projects within Zambia. The company’s key asset currently is the 100% owned Luiri Hill Gold Project in the Mumbwa district of Zambia, representing 277km2 of granted tenements under mining licence, which is valid for 25 years and renewable. The project is centered on the Matala and Dunrobin deposits, which have a combined JORC resource estimate currently of 10.591 million tonnes at 2.2 g/t Au, for 758,000 ounces of gold. 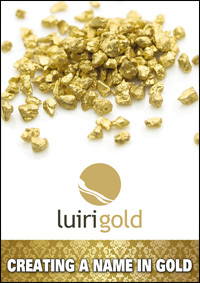 As of now Luiri Gold’s main strategies are focused on: leveraging its technical and economic knowledge and available funding in acquiring, producing or production of ready gold assets; utilising cash generated by the fast track development of gold production from the Dunrobin deposit from 1H 2014 to fund its activities; proactively exploring for further gold targets on its tenements in Zambia; and acquiring ground-breaking gold projects internationally, which are located in favourable mining locations and at varying stages of development. Over the past 12 months, Luiri Gold has been focusing on the progress of their projects through a scoping and feasibility study as well as an exploration program which aims to establish a measured resource to increase the overall resources. Alongside technical work, Luiri Gold has worked hard to establish sold relationships in the country and now boasts strong working relationships with many government ministries as well as local community leaders. The company also focuses on complying with practices in corporate governance, anti-bribery, environmental standards, health and safety in order to ensure that they produce a sustainable mine that will only enhance the lives of its miners as well as the local community. In concurrence with the settlement agreement made with the Zambian government, Luiri Gold has made official commitments to the local communities located in the vicinity of its operations. This include the initial funding of a communitiy development trust fund as well as a payment of US$150,000 to the community fund. Most recently, the company was happy to provide 24 hour power to the local community clinic in order to show constant support to those that live in the surrounding area of the mine. The successful establishment of mining operations is anticipated to provide employment opportunities both direct and indirect to the community as well as several additional long-term benefits to all stakeholders. 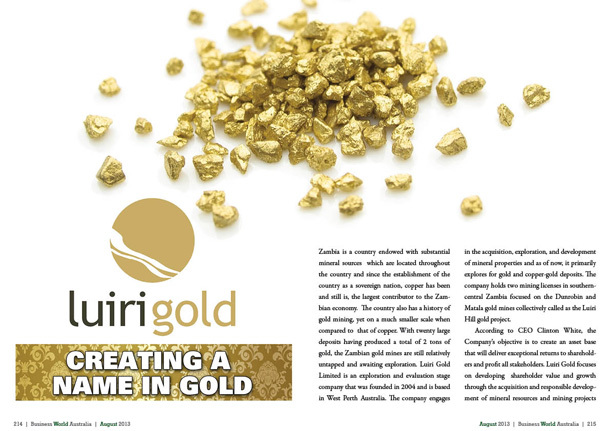 This is not seen just as another obligation to Luiri Gold; it is a key factor in the company’s value system. Since they are taking from the land, it is only natural to give back to those who live on it; to create harmony and balance, guaranteeing a flourishing venture and community. The value system as well as several of the company’s ventures and ideas are spearheaded by its experienced management team. Several of the company’s team members and board of directors have been involved in the industry for several decades and have a passion for investing and furthering African exploration. Clinton White, was appointed CEO of the Zambian subsidiary Luiri Gold Mines in 2011. White, who is a geologist with over 20 years experience in production and general management has a strong vision for the future of the mine and is collaborating with his fellow team members to bring their plans to fruition. Another very important member of the Zambian team is Gabriella de Mori, the corporate social responsibility manager, who has extensive experience in Zambia. Her focus is on the coordination and development of community research and assessment projects, funding opportunity assessments, development of corporate social responsibility policies, community engagement strategies and project management of corporate social related investments. She has been a great influence on the policies crafted in forming relationships with local community members. Ms. Mori often coordinates with His Royal Highness, Senior Chief Shakumbila, who is the traditional leader of the Sala people in the Shakumbila Chiefdom of the Mumbwa District in Central province. Senior Chief Shakumbila is the chairperson of the Board of Trustees of the Shakumbila Trust, a non-profit making organization funded and co-managed by Luiri Gold Mines to oversee local development projects and community initiatives. As of now, the plans for the future include a completion of the mines’ feasibility studies, new resource statements, continued support to the local community, enhancing shareholder value wherever possible and getting the mines up the highest standards possible. With a solid strategy in place, a strong board of investors and a focus on corporate social responsibility the company has nowhere to go but up.